juice of 12 lemons, add enough powdered sugar to sweeten. 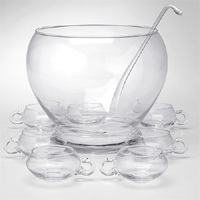 Pour over a large block of ice in punch bowl and stir. Then add remainder of ingredients. Stir well and decorate with fruits in season. Serve in punch glasses.